But what about the oceans? Research shows declining levels of acidity in Sierra Nevada lakes | Watts Up With That? Researcher Peter Homyak is seen here collecting a lake sediment core to study the impacts of air pollution and climate change on alpine lakes of the Sierra Nevada. Credit: Sickman Lab, UC Riverside. 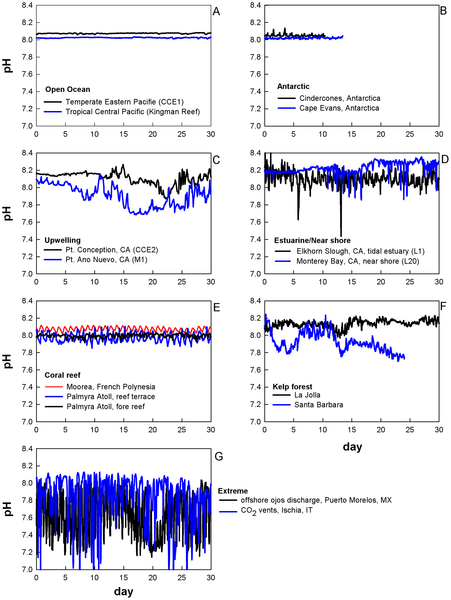 September 4, 2014 in Ocean acidification. The ocean intake pipe that supplies the Monterey Bay aquarium has tested pH levels for many years. It shows no change in ocean pH. Other records show the same. Here is another graph of the Monterey Bay pH record. It seems the “acidification” scare is another failed prediction. Monterey Bay Aquarium used to have a diurnal plot of pH that was very informative but I haven’t been able to find it recently. It’s probably still there, just hard to find, but the diurnal fluctuation was very interesting. Hi dbstealey: I’ve know of this for a while. The data seem to match the UAH Satellite temperature data pretty closely. That is, you can see the 1998 warming, and slighr increase in pH… With perhaps overly simplistic thinking, one might infer that as temperatures increase, less atmospheric CO2 can remain disolved in seawater -hence increases in pH. nice to know that the Monterey Bay Aquarium single data point is indicative of the entire earth’s ocean system. !! You’ve obviously been around long enough, so why antagonize with your silly interpretations. Well that is utterly fascinating… looking at the bottom graph that was linked on Joanne Nova’s site, one can see the pH for a relatively isolated piece of water (the Mediterranean, or possibly the Adriatic) over a volcanic vent that presumably dumps CO2 into the water. It still only turns the water neutral (or maybe slightly acidic) for extremely brief periods, and only occasionally. ‘Course if that vent is dumping SO2 into the water, it would be even more effective at reducing the pH… Either way, the notion that atmospheric CO2 concentration could have a substantial, lasting impact on dissolved CO2 levels with a consequent reduction in pH seems even less likely. Thank you for posting this article pointing to another benefit of reducing emissions from coal power plants. Hooray for the Clean Air Act! Barry, I recently read an article that stated that Los Angeles gets about 50% of their electrical power from coal. The coal power plants are located in Utah and Arizona. Not in my backyard. Barry, I think the biggest problem in California was automobile exhaust emissions, not coal power plants. And if it wasn’t for electricity supplied to southern California (some of which is generated by coal), that part of California would be in the dark. Indeed, the clean air act of the 1970s and 1980s was a good thing. However, every change they have made to the regulations since then I would argue have been detrimental. Driving up the cost of energy by a factor of 3 or more cause much misery and poverty, resulting in much more ill health to the population than they are possibly mitigating. Barry please show me all the articles posted at WUWT, or any other skeptic site, that encourage dangerous and unpleasant levels of particulates. You se Barry, some things are really bad, and some things are a little it bad, and some things like CO2 , are very healthy. Considering the geology of the Sierra, which changes from north to south with greater exposures of granite – an acidic igneous rock – dominant in about the southern two-thirds, it would interesting to see whether there is a correlation with surface geology. The article is pay-walled though, so, no maps to investigate. Duster, note that the term “acidic” when applied to igneous rock is an expression of the SiO2 content (silica) and not to pH. However, your comment in regard to what lithologies the lake waters are exposed to and how that may affect their pH balance is a valid question. In my personal experience the pH from streams draining weakly altered andesites/diorites [feldspars altered to clay/carbonate] can be higher than from streams draining from massive limestone. Possibly something to do with the grain size of the carbonate. So the effect of local geology can be significant for lakes and streams. What is are the others? Paywall. I wonder how the pH of the lakes compare to average ocean pH? Total SWAG here, but I’m going to guess the lake’s pH is close to neutral. I’d bet my right arm that it’s substantially lower than seawater. I live on a stream in the Colorado Rockies. It runs through basalt, originating near the base of what was a volcano. Its Ph runs 9-10. I lower it for my blueberries and delphiniums. Never let facts get in the way of a good disaster theory. SO2 /SO3 and NOx are strong acids when mixed with water. SO2/SO3 and NOx rain out of the atmosphere within a few days, which makes that the deposit is within relative short distance of the (mainly industrial) sources. With stronger acids in fresh water, the uptake of CO2 is even less, due to the lower pH and the equilibrium reactions of CO2 with bicarbonate, carbonate and hydrogen ions . That plays far less role in seawater which is much larger in volume, but also a buffer solution for acids, including SOx, NOx and CO2, due to the huge amount of (bi)carbonates present. Much depends of the amount of carbonate that is encountered by the runoff for fresh water: if carbonates are present, they are in part dissolved by the extra acids, and that increases the pH towards neutral. In Scandinavia, where the bottom is often bare granite, the pH could drop to 4 and lower, thanks to the industry in England, which was a real problem 30 years ago, but largely solved today. plus repeated ships measurements over different ocean tracks over time. sort of like the “low phosphate” washing soap promoted in many areas. it only makes a difference in fresh water. the oceans, being phosphate poor (life quickly consumes the excess), would benefit from more phosphate washing soap. so, it you live on the coast, paying extra for “low phosphate” soap is a scam. much like paying for CO2 emissions. life would benefit from more CO2, because the atmosphere is CO2 poor. (life quickly consumes the excess). Indeed yes. With the two basic conduits for organic solar energy capture being Hydrogen (in the form of H2O) and Carbon (in the form of CO2); why in the hell would anyone want to reduce the already precious tiny amount of CO2 in our atmosphere?!? Good summary and kept me from having to write anything similar. Only one comment — one of the main sources of NOx is lightning. In general, this is a good thing. Lightning creates enough NOx to continually fertilize the ground with a (literal) rain of nitric acid and ammonia. Although e.g. cyanobacteria can and do also directly fix nitrogen from the atmosphere into plant-usable form, lightning and weak “acid rain” are an important source as well, and the nitrous oxide (NO_2, laughing gas) produced is an “important greenhouse gas” and also catalytically reduces stratospheric ozone. Nitrous oxide requires high temperature (or biological action) to form, as N_2 is quite stable, so lightning bolts or combustion-based power plants are the only two common sources. Coal plants thus produce acid two ways — one is comparatively weak and arguably beneficial — nitrous oxide combining with water into nitric acid which, in dilute form, is basically a fertilizer and a primary basis for all protein. The other is sulphates from high-sulphur coal (or oil). This produces sulphuric acid when it dissolves with rainwater, and can drop the pH enough to damage lots of things — trees, plants, even humans. OTOH, atmospheric sulphates are a high-albedo aerosol and probably/maybe have a net cooling effect. Coal sulphates were one of the “causes” to which the “coming ice age” was attributed to back in the late 60s and early 70s. The Clean Air Act did have an enormous impact on sulphates and soot, and it has been hypothesized that at least part of the warming “burst” of the 80s might be attributable to the atmosphere “catching up” on deferred natural warming as aerosols gradually cleared. A related question is whether or not the less than pristine overseas coal plants being built are raising aerosol levels again in such a way as to obstruct expected warming. Perhaps the solution to global warming is to burn dirtier coal or otherwise artificially maintain aerosol levels. 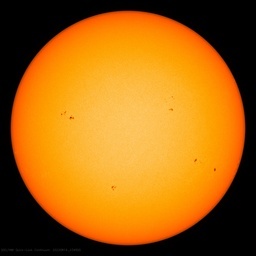 Or perhaps not, since AGW is not quantitatively understood or predictable. However, in the case of the lakes in question, it isn’t completely unreasonable that they are still rebounding from acidification caused by more potent atmospheric sources than mere CO_2, or — as has been also pointed out — it could be the result of buffering or chemistry with the local rock. Much of the US west of the Mississippi has basic soil, and hydrangeas there grow purple. The east coast is more likely to be acid, hence our acid-loving azaleas and blue hydrangeas. I don’t know the geology of the Sierras, but if they are limestone, or other sedimentary rock, it is quite possible that they have substantial buffering capability over time. Unless I’m mistaken, laughing gas is N2O, not NO2. Irrelevant, unless you’re inhaling them. NO2 will not make you laugh! I enjoy your posts, Dr. Brown! I am all for removing as much sulphur and nitrogen oxides from transportation sourced emissions as possible. The potential impacts of sulphur and NOx are many on air quality, breathing problems, water and soil acidification, on and on. Sulphur is a key pollutant that needs to be targeted, and I am solidly behind the Clean Air Act use to reduce sulphur emissions. CO2 though is not a pollutant. Better not giving them any ideas. Alarmists believe 0.0004% change in the atmospheric composition cause the oceans to boil over and Northern polar ice to fall off a cliff. Now, dry air contains 78.09% nitrogen. Imagine the quantity of potential acid. What seldom gets mentioned is the stack scrubbers from coal fired power plants miss the very small particulates which cause many respiratory problems. Only bag houses capture those. Needless to say, that’s also the most expensive way to go and seldom required outside of the US. (i) CO2 + H2O H2CO3 H+ + HCO3(-). CO2 is produced for the larger part by the coral cells themselves. (iii) the adjacent coral cells (calicoblastic cells) actively pump H+ ions out of the mineralization zone. The removal of H+ drives the equilibrium of reaction (ii) to the right, stimulating further the precipitation of CaCO3. So HCO3-, not CO3(2-) is the building block. I am guessing it killed the authors that things were actually improving – can’t be alarming when the news is good. I guess it shows how cynical I have become of any “environmental ” research. Why am I seeing trees above an “alpine” lake? There are trees in the local of alpine lakes. Surprisingly, maybe, the sierra pines and junipers will grow out of fissures in the rock. There are many incongruous and beautiful examples of trees growing on plutonic rock. Search for “Bonsai Rock” at Lake Tahoe. The real way CO2 and oceans work. [CO3–] is directly proportional to HCO3-, thus as HCO3- increases in concentration, so does CO3– This is in direct contrast to the way the acidificationists like to show it, that CO3— drops with CO2 addition. Good news? Well, his research funding is going to dry up. Mountain lakes are fed by rainfall in their catchment basins. Presently US rain pH varies around 5.7-5.8. It used to be 5.0-5.5 ‘acid rain’, and probably still is in China. That pH is buffered by the catchment basin surface geology. It remains pretty much as falls in igneous (granite, basalt, metamorphic schist) geology, which is why the US northeast had acidifying lakes. It gets buffered up over limestone carbonates. US declining lake acidity is mainly due to reduced sulfur dioxide emissions, in turn from switches to lower sulfur coals (Wyoming instead of Illinois) and/or wet scrubbing of flue gases and lower sulfur diesel. Very different dynamic in the oceans, where rainfall is literally ‘a drop in the bucket’ and dissolved minerals (other than salt) provide a hugely buffered chemical system. AR4 missed that buffering, which is why the 2007 prediction for ‘ocean acidification’ (yes, really a slight decline in alkalinity) was twice (8.2 to 7.8) the more realistic projection in AR5 WG1 3.8.2 of maybe 8.0 in the worst scenarios. 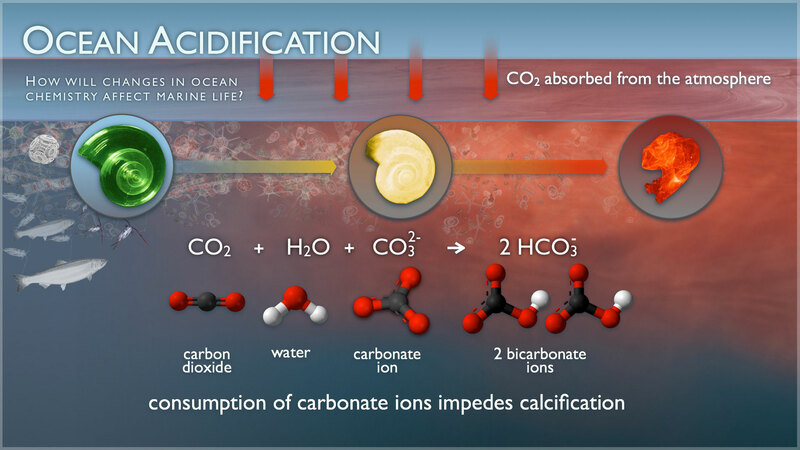 The chart posted explains the CO2/carbonic acid/carbonate chemistry behind ocean acidification but still misses an essential additional fact. There are observed seasonal fluctuations of up to delta pH 1.4 in places in the Pacific. The seasonal West Coast upwelling causes a change from 8.1 to 7.7 (measured at the California/Oregon border by PMEL), since sea water just below the euphotic zone has naturally lower pH than in the euphotic zone where photosynthesis is removing dissolved CO2. That should be roughly the Monterey Bay variation, which the aquarium may buffer out (I don’t know). In the Elkhorn Slough estuary on Monterey Bay, the seasonal variation is 7.4 late winter to 8.4 late summer. During the summer, heightened estuarine photosynthesis consumes more CO2, and the pH naturally rises. In winter, the heightened decomposition of organic matter lowers the pH. The estuary swing is more pronounced than the coastal upwelling simply because there is more intense biological activity. None of this important common sense stuff ever gets mentioned by warmunists. Above information with deeper explanations and lots of footnotes in the essay Shell Games from my next book going to the publisher hopefully next week. Deconstructs what appear to be deliberate ‘official’ misrepresentations concerning coral reefs and oysters, including but not limited to NOAA PMEL, NOAA, and the EPA. A rain pH of 5.7-5.8 might be completely attributed to CO2 in rainwater. In theory, when pCO2 = 3.5×10(-5) atm, approx 1.18 × 10−5 M CO2 will dissolve in pure water at 25 C (Henry’s Law). This will lower pH to approx 5.7. There is a fundamental problem with this article and all the above comments. The problem is the use of the term “ocean acidification”. The Ocean pH level is Basic. Any slight change in pH in the seas is, as coined by a commenter here on WUWT, making the ocean “less caustic”, that is less basic. The point being that when AGW cultists start raving about ocean acidification you can blow their doors off by correcting them to “less caustic”. It the uninformed public’s mind the word acid conjures up horrors of mangled flesh. What is not as well known is that very strong bases are as dangerous as strong acids. A strong base can do as much damage as a strong acid. The use of the term ” ocean acidification” is pure propaganda. WUWT and we “knowledgeable commenters” should never use it. Flying doors are by a funny byproduct of scientifically correct terminology. Just for the record I was nearly maimed by a flying door. Probably an acidic door. Corresponding author address: National Park Service, 47050 Generals Highway, Three Rivers, California 93271, USA. Address NPS, email is nps.gov. Thus it is a product of the US federal government, identified as such, thus does not have copyright protection. So where is the free download link? Must we FOIA to force them to disclose what must be a public domain document? Strangely, none of the catastrophist ocean acidification brigade have managed to explain to me how the oceans can simultaneously warm and increase the amount of dissolved CO2. Not a mystery: the warming of the oceans gives some increased pressure of CO2 to escape the ocean surface, discussions are about the exact pressure increase: somewhere between 4 and 17 μatm/°C. That means that for the maximum 1°C temperature increase of the ocean surface since the LIA, the increase in the atmosphere would be at maximum 17 ppmv (average ratio over the past 800,000 years is 8 ppmv/°C). The real increase is over 100 ppmv, thus some extra CO2 is pushed into the oceans, which caused a small drop in pH. This paper is completely BS. Co2 is part of an extended equilibrium from CO2 to carbonic acid to bicarbonate to carbonate to calcification with the abundant calcium ions. More CO2 pushes this equilibrium to increased calcification. What these dim bulbs do not realize is that the free protons (hydronium ions, acidity as they want to call it) from this equilibrium CANNOT affect itself. Only an outside source of protons can later this equilibrium. In addition, photosynthesis by algae and phytoplankton is an alkalizing process and the pH (basicity) of the ocean can rise 2–3 pH units during a sunny day. Marine organisms also do not rely on carbonate for calcification. They are perfectly able to take in CO2 directly, or bicarbonate and create the carbonate they need. Their interior pH is entirely under their control and they will do what they want with any of these chemical forms. Wait a minute. These particles can also come from forest fires and biomass fuels. With the decline in forest fires, it seems to me that fire suppression may be causing an un-natural DECLINE in these carbonaceous particles. Given that natural burns were far more frequent in the past than they are now, I am betting they have discovered a direct result of un-natural fire suppression, not a result of the Clean Air Act in these lakes. I would hazard a guess that before civilization, the smoke in the air from natural sources would have choked a maggot. In principle it is quite easy to make a distinction between recent/biomass burning particulates and burning fossil fuels: fossil fuels are completely depleted from 14C, while particulates from burning biomass still have some 14C level, depending of their age. This was used in Vienna to detect the ratio of fossil/recent fuels in black carbon deposits. Except that, for example, limestone (CaCO3) makes up about 10% of the total volume of all sedimentary rocks. How does 14C in it differ from fossil fuels? jaakkokateenkorva, if it is CO2, the distinction is in the 13C/12C ratio which is a lot higher in carbonate rock than in fossil fuels, even if both are virtual 14C free. If it is in black carbon, as the introduction says, that can’t be from carbonate rocks, only from fuel burning. As good from recent fuels as from fossil fuels, where only the latter is 14C depleted. Why don’t you read a middle school chemistry text? You might find the answer in there. Richard has a strong habit of opening his mouth to talk. A lot. And his style readily changes from factual to snooty retorts. His “tin foil hat” comment is very demonstrative of this habit he tries to deny. Yet no one I know would consider that kind of “answer” resembling his assertion that his answers are straightforward and devoid of ridicule. On the contrary, at times they are marinated and boiled in it. Richard, the hand of the finger you point is pointed back at you three-fold. But back to carbon. Deciding the source of carbonaceous particles is not easy. I refer readers to the following link which demonstrates the difficulties involved in determining source. Ferdinand, me thinks you paint too simple a picture thus I stand by my contention that the source of particles in lake sediments could very well be forest fires. Thus the downward trend could be reflective of fire suppression.